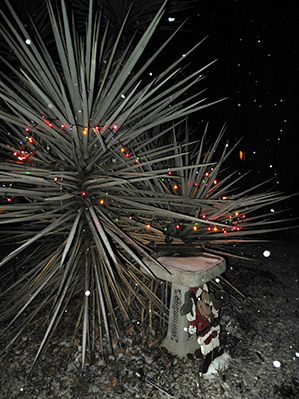 Following flurries at various points during the day Friday that didn’t quite stick, Artesians were treated to a post-Christmas blast of winter weather Friday evening when snow fell for a few hours in the city. 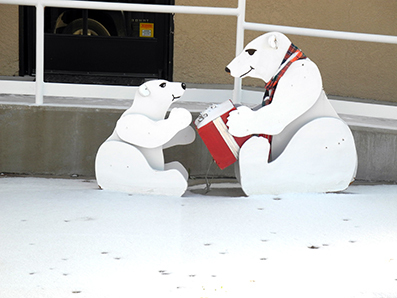 Although the light coating it left behind didn’t last long, the polar bears pictured above looked right at home near the intersection of Seventh and Main streets, while snowfall around the Christmas-light-bedecked yucca below made for a lovely “desert holiday” scene. An additional chance of snow is forecast for Artesia for this evening (Jan. 2).